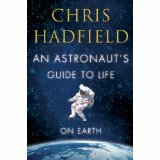 On July 1 I posted my book review of Chris Hadfield’s book An Astronaut’s Guide to Life on Earth. I should have also mentioned again the post I had written about his talk about facing one’s fear; you can watch it here. Today I am posting the trailer for his book, which I would have included yesterday had I thought to look for one. (Thanks to Erik for the heads-up about this.) It is so funny and I hope you will enjoy it. Click here to watch it. Do book trailers increase your interest in a book? Do they help you make a decision about buying a book? This entry was posted in Miscellanea, Mostly About Reading, Reviews & Interviews and tagged An Astronaut's Guide to Life on Earth, book trailer, Canadian astronaut, Canadian author, Chris Hadfield, facing one's fear, fear. Bookmark the permalink. I love book trailers and this one is great! I also love Chris Hadfield and everything he does. I like fun ones the best, and his fits that category. 🙂 What’s not to like about Chris Hadfield!